If you haven't been to one before, you're in for a real treat! 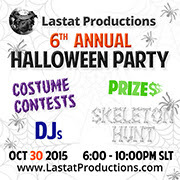 Every year for Halloween we host a huge event with live mix DJs, costume contests, hunts and more! We build a custom set with haunted buildings, an eerie forest, a scary pumpkin patch and plenty of ghosts too! This year we'll have two costume contests with over $10,000L in cash prizes! We also have a hunt for Dead Fred's bones where everyone has the chance to walk away with over $2,500L in prizes from Lastat Productions. As an added bonus, all prices will be slashed to 50% during the event! This year is estimated to be our biggest party yet so don't miss out! We hope to see you there!